Hillary’s Review of ‘Guardians of the Galaxy’!! I was waiting for this screening, I’m not going to lie. I was excited to see if the movie was going to live up to the hype! I mean, James Gunn, an all star cast, a killer soundtrack, Marvel? Could it do it? Guardians of the Galaxy did! From start to finish this is an action packed movie! It opens with Peter Quill’s (Chris Pratt’s) back story. 1980’s. He is on Terra (Earth) and his mother is dying and he runs outside to escape the sadness is immediately abducted, and whisked away to…. Cut to the present day, future and space, and Peter Quill is a ravager, or thief, known as Starlord, and is seemingly, as you can tell from this opening action sequence, always in the thick of it. I don’t want to give too much away, but the plot unfolds quick, and he meets his fellow travelers fast, as he stolen an orb that Gamora (Zoe Saldana), adopted daughter of Thanos wants. His other daughter, Nebula, is played with icy malice by Karen Gillan, and there is obviously tension between the sisters, as Thanos visibly favours Gamora. Nebula and Gamora are both in the company of Ronan, a rogue Kree who is looking for the Orb to destroy the planet of Xandar, which is homeworld to the Nova Corps, the intergalactic police corps. 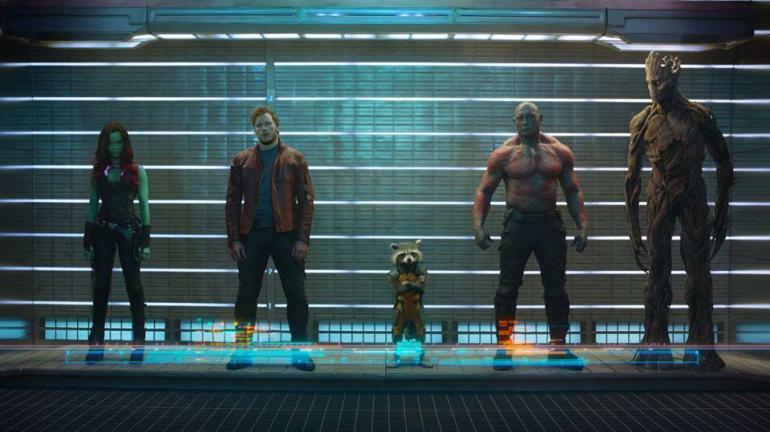 And, as an outlaw who is wanted as a thief, there is a bounty on Quill’s head, so when he heads to Nova Prime, he encounters Rocket, a cybernetically enhanced raccoon (voiced by Bradley Cooper), and a humanoid tree called Groot (voiced by Vin Diesel), and they want to take him in to collect. And all of this is plain in the first twenty minutes of the movie! There is so much action in this scene on Xandar, and they are all arrested and thrown in prison together by Nova Prime (a choice small role starring Glenn Close) and her deputies (Peter Serafinowiz and John C. Reilly of the Nova Corps). This is where the Guardians meets Drax (played perfectly by Dave Bautista) the Destoyer. Drax speaks literally, literally. And his delivery is hilarious. The prison sequence is genius and full of good fun. All of the characters are well thought out and Chris Pratt OWNS his character and his delivery. I love how James Gunn includes his brother in the renegade Ravagers, headed up by none other than Michael Rooker in a hilarious and deadly cameo. And I won’t give away the unbilled voice of Thanos, but WOW. That scene was so gorgeous. And kudos to Alexis Denisoff for again, being unrecognizable in his make up as the scion of Thanos! There are so many amazing scenes and the movie really flows well together, without giving too much away. But there are a few over used gags from other movies, and of course, aside from a killer soundtrack, there are a few songs that are obviously visible from other movies. This movie is an incredible ensemble cast film, and I think it was the summer superhero movie we were waiting for. It’s not Avengers, but hey, until the Age of Ultron, it’ll do. Here’s The Amazing ‘Guardians of the Galaxy’ Trailer!!! This entry was posted on Thursday, July 31st, 2014 at 10:48 am	and is filed under Comics, Film, News. You can follow any responses to this entry through the RSS 2.0 feed. You can skip to the end and leave a response. Pinging is currently not allowed. 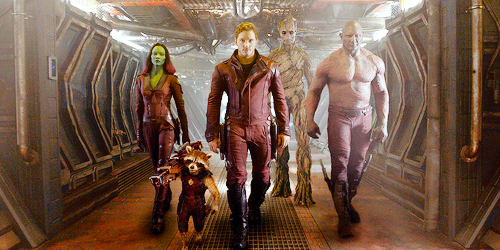 « Film Review: Guardians of the Galaxy’! !